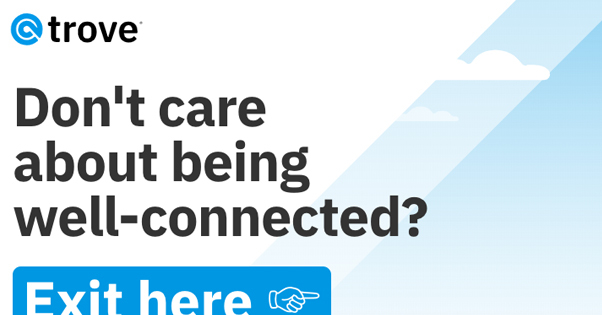 Unroll.me is a service that many people have used over the years. You give it access to your email inbox, and it goes through and identifies all of the email newsletters and mailing lists you’re subscribed to. You can then go through and choose which ones to keep and bulk unsubscribe to the rest of the automatically. For those of us with email addresses over 10 years old at this point, it’s a service with a lot of benefits. I know I’ve had hundreds of mailing lists add me over the years, from downloading an ebook here or registering for a contest there. There’s just one problem: apparently, Unroll.me has been using their access to your email inbox to scrape data about you to sell to advertisers. Uber, apparently, bought data about users who have Lyft receipts in their inboxes, provided to them by Slive Intelligence, the company that owns Unroll.me. So here’s the thing. 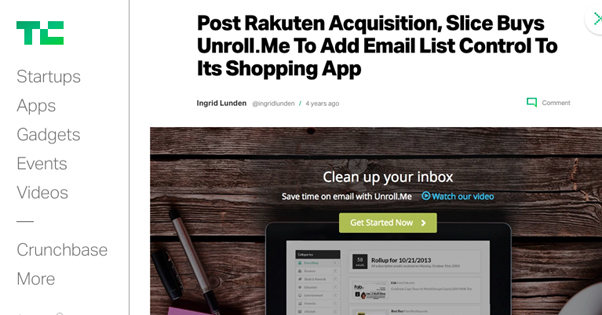 Back when Unroll.me hit the market, it was a small startup run by two people. It was, back then, perfectly safe to use. They didn’t steal information or sell anything other than their service. At some point, though, Slice Intelligence bought Unroll.me and added it to their broad portfolio of market research – read “information harvesting” – apps. That point was back in 2014, according to this TechCrunch article. The problem comes when you realize that, while using Unroll.me is usually a one-time thing, very few people actually then remove the tool. A lot of people install it, have it tear through their inbox and unsubscribe from a few dozen mailing lists, then forget about it. And that’s exactly what it wanted. Unroll.me languishes on the authorized apps list for an uncountable number of users who have long forgotten it existed. There it sits, passively harvesting data to sell, while you’re none the wiser. As an aside, remember that most social networks and a lot of other services that have APIs will have app authorization pages as well. Facebook, Twitter, LinkedIn, Instagram, and all the rest have their own sets. It’s not relevant to the Unroll.me problem, but it’s good practice to check every few months and see if there are apps you no longer use that you should revoke authorization to. Look for the Unroll.me app authorized to your email account and revoke access. 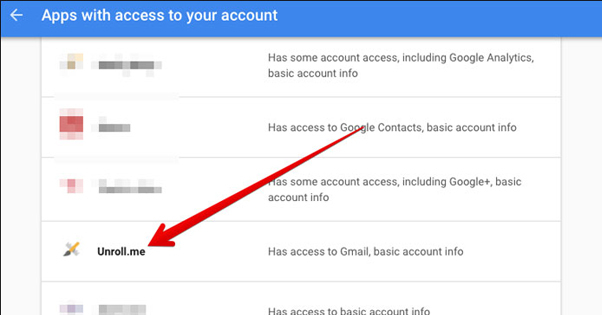 This will immediately remove it from your email account and require reauthorization if you want to use it again. Next, you should go to Unroll.me’s site itself and log in. Up in the corner you will find an expanded menu with the settings and logout options. Under settings, down at the bottom, there’s a “delete my account” link. It’s pretty small, since they don’t want you to accidentally click it, but you can definitely click it on purpose. Just go ahead and do so. There’s a pretty good chance that Unroll.me will send you an email asking for permission to access your account once you revoke that access. Go ahead and unsubscribe from that as well, just to deliver that one final kick in the pants. 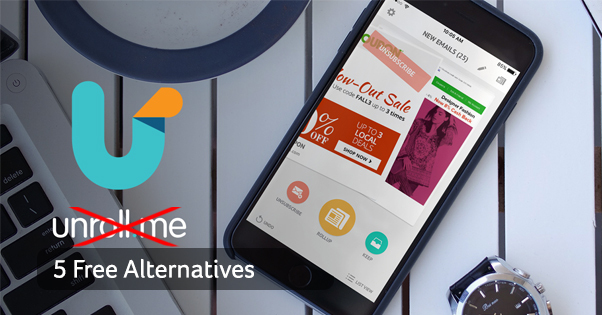 There are, thankfully, a lot of alternatives to Unroll.me that aren’t stealing your data. Or, if they are, they’re a lot more surreptitious about it. First up, one that is technically one of the five alternatives but maybe shouldn’t be because it’s a default feature: just do it yourself. When you get an email that’s on a mailing list, by law it has to include an unsubscribe link. If it doesn’t have one, it’s a spam mail, and should be reported as such. This is part of the anti-spam legislation adopted quite a while back, in 2003. Gmail also includes a nice link up at the top in the subject line of any email you get that has an unsubscribe link in it. Sometimes, you know, that link can be small and difficult to find, since they don’t want you to unsubscribe. They need to include it by law, but they aren’t going to make it easy. Gmail puts the link up at the top. You see subject line, sender, and unsubscribe. Clicking either the unsubscribe link in the email or the one Gmail adds will allow you to follow whatever the normal process is for that business. Usually it’s either logging into the site and changing email preferences or just plugging your email address into a form and clicking “remove me.” In general, it’s quite easy. The only reason services like Unroll.me exist is because, once you have an old enough address, you’re getting tens or dozens of newsletters every week, and it can be a hassle to go through and do this for every single one of them. That, and they let you keep track of the mailing lists you’re on, or were on and have removed. Now for the actual alternatives. You probably want something that can keep track of what you remove, or remove mailing lists in bulk. If so, here are options you can check out. Not to be confused with what I just described, that is, using the default unsubscribe feature in Gmail. This is a plugin for Gmail found open-source on Github. You install it and it scans your inbox looking for anything that fits the bill as a newsletter. 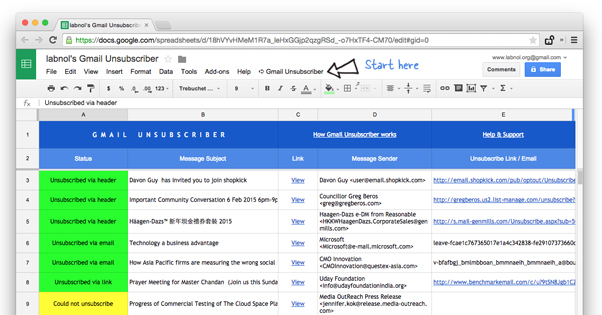 It will then try to unsubscribe, and will add a report about the newsletter to a Google Sheet. The sheet, by the way, is very nicely set up. It includes a bunch of columns of data. It shows you email status, telling you whether or not it was able to unsubscribe. It gives you the subject line for the mail you received, and a link to view it if you haven’t deleted it. It gives you information about the sender of the email, both their display name and their email address. And, of course, it includes the link that was used to unsubscribe, if it was able to successfully remove you from the list. All of this is great for data analysis and just for keeping track of how successful it is at its job. There’s not a lot of definition to this script, and it does require a little bit of configuration. 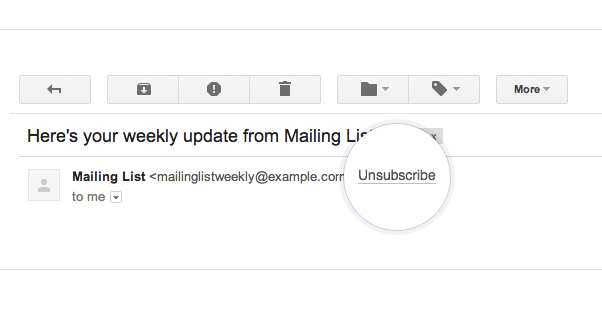 You need to create a Gmail label (Unsubscribe is the default) and apply it to any newsletter you want to remove from your box. You can do this a bit more easily by applying Gmail filters. I’ve written a lot about filters over here, which will give you a good idea of how you can set up a filter fairly easily. Go ahead and set up a filter to unsubscribe from anything you want, and each time a new newsletter hits that label, the script will unsubscribe you from the list. Trove is a sort of replacement email client and connection management system, sort of like a hybrid between Gmail and LinkedIn. It allows you to prioritize your connections to other people and companies, with a lot of bonus features for networking and connection building. You can see and explore your entire network of connections and acquaintances, you can invite other people to join your network, and so on. Trove is actually most useful for networking purposes. You can use it quite well to kickstart some influencer marketing or blogging outreach. I’ve used it to great effect for some guest posting opportunities and to make a couple new friends. Crucially, when it scans your connections, you’ll be able to see a list of those “connections” that are just mailing lists, and deprioritize or remove them. That’s the feature you’re after, right? Plus, they have a very strict and very open privacy statement, if you’re at all concerned about it. Probably the biggest benefit of Trove is the connection building, but the newsletter management is fine, and for individual usage it’s all free. They have a business plan, but if you’re just using it as a personal professional or one-man business, it’s free to use. Cleanfox has a few benefits over the other options thus far listed, but also a couple of drawbacks. For one thing, it works with Gmail, but it also works with Outlook and the other Microsoft email services, as well as several other email providers. Secondly, the app has mobile versions on both the Google Play store and the Apple App Store. If you’re one of those folks that habitually uses a mobile device for everything rather than a desktop platform, this can be very convenient. When you install and run the app, it will scan your inbox and provide you a list of newsletters. For each newsletter, you can choose to leave it as is, you can stay subscribed to it but delete older emails from that sender, or you can unsubscribe and remove old newsletters. It’s worth noting that Cleanfox claims they never delete emails permanently, but the fact is they put them in the trash folder, and in something like Gmail, that means you have 30 days until they’re permanently deleted. So yeah, technically they aren’t doing the deletion, but they’re gone just the same. Possibly one of the more interesting features of this app is that, when you use it, they plant a tree in Africa, specifically in Zambia. They’re a Green Cross supporter and partner with WeForest. It’s a fairly benevolent charity to support. The only downside is that Cleanfox may have similar issues to Unroll.me, if you’re extremely concerned with privacy. They’re part of FoxIntelligence, which collects and anonymizes data for use in research panels. This may or may not violate your privacy rules, depending on how much you care about anonymous data aggregation. Feel free to read up on it on their site. 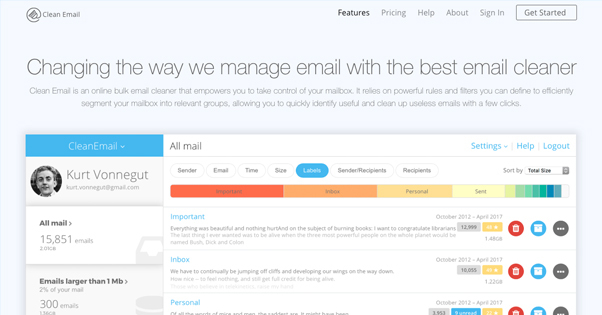 Clean Email is sort of like Unroll.me but on steroids. 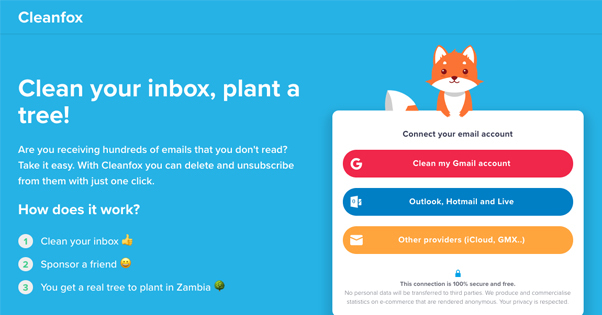 It has a ton of email sorting, analysis, and cleaning features, and is one way you can go from thousands of messages to that coveted Inbox Zero in just a few hours at most. When you first run the script, it does a very broad categorization of what’s in your mailbox. It will sort messages into categories like “social network notifications” and “old emails” and “drafts”. You can, with one selection, apply one action to everything in the category if you want. Once you’ve performed your initial sort, you can go into individual categories and apply actions more individually. You can move messages to trash, archive them, remove them, block senders, or mark them as spam. Alternatively, you can apply priority flags, label or star them, move them to folders, or even mark as unread. Bulk unsubscribe is, of course, a default feature. Whitelists also allow you to protect certain messages or senders from otherwise applicable bulk actions. *Of course, since they aren’t monetizing by selling your data, Clean Email costs money to use. For one account, it will cost you $8 per month for a subscription. Worth it? That’s up to you.